The Common Gavel, used by operative Masons to break off the corners of rough stones, is in speculative Freemasonry a symbol of power. The Twenty-four-inch gauge is an instrument used by operative Masons to measure and lay out their work, but in speculative Freemasonry we are taught by its symbolism to divide our time into three equal parts, whereby are found eight hours for refreshment and sleep, eight for our usual vocations and eight for the service of God and humanity. There is an object in view and an end to be attained. It is, therefore, a symbol of purpose. Power is the ability to act so as to produce change land cause event. Purpose is the idea or object kept before the mind as an end of effort or action. Modern science has uncovered so much power that thoughtful men fear it will work the destruction of civilization unless a commensurate humane purpose is developed for its direction. The day and generation in which we live pulsates with power, the world is held in place by dynamic oppositions, the universe is vibrant with force and man is a part of the divine energy. The greatest think in God's created universe is a man. 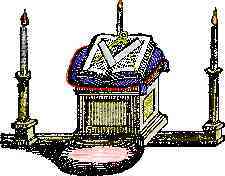 In him, according to the teachings of Freemasonry, is the eternal flame, the indestructible image of the living God. The power of man cannot be defined, cannot be fenced in, because it transcends all finite standards of measurement. Power directed by a bad purpose is positive destruction. Alexander the Great was the most powerful man of antiquity. With an army of 35,000 men he flung himself against a Persian horde of over one million. He conquered the world, but could not master himself. Intent on lust and luxury, dissipation and destruction, his purposes were bad, and at the age of forty-two he died in a drunken fit. Charles the First of England insisted on the divine right of kings. he had his courts decree that the King could do no wrong, filled the Tower of London with political prisoners, tortured and decapitated his enemies, claimed the right of life and death over his subjects, and exercised the unlimited power of an absolute monarch. His purposes were bad, and under Oliver Cromwell his career was canceled, the executioner swung an axe and the head of Charles the first rolled in the dust. These were unusual men occupying exceptional positions, but the power of destruction is terrific in the most ordinary life. Czolgoez, the polish anarchist, was a man of a low order in the social scale, without wealth, without influence, without education; from the casual viewpoint ignorant, insignificant and weak. His mind was the breeding ground of crazy purposes, but he had sufficient destructive power to shoot William McKinley and assassinate the Chief Magistrate of the greatest nation on earth. Power directed by a good purpose is constructive, and results in achievement. It keeps the cars on the tracks and the wires in the air, it turns the wheels of man's industry and carries the commerce of continents as upon a mighty shoulder. Warren Hastings was born in 1732; his mother was a servant girl who died when the baby was two days old; his father deserted him, so he grew up as a charity child. He had a hungry mind and obtained an education as best he could. When eighteen years of age he shipped for India, working his own passage. He had a purpose in his life and there came a power that enabled him to establish the Bengal Asiatic Society, to found colleges out of his own funds and in his own name. Disraeli said English supremacy in India was the direct result of this man's work. Today the memory of Warren Hastings is linked with the greatness of the British Empire. David Livingstone was a humble Scotchman, the son of a weaver and himself a worker at the spinning wheel. Into his soul there came a great purpose of life, and he went to South Africa as a missionary. He was frail of body, never physically strong, but with the purpose there came to him a power to brave danger and endure privations. For a period of twenty years he blazed a trail of light through a dark continent, destroyed the slave trade in negroes, and convinced the world that the salvation of Africa was a white man's job. In that commission he surrendered his life on his knees in supplication to God. His body was carried thousands of miles by a black man through jungles, over rivers, across land and seas; last summer at Westminster Abbey I stood before his mortal remains buried and honored in the sepulcher of Kings. In his early manhood Abraham Lincoln stood before a slave market in New Orleans. Upon the block was a young woman, stripped to the waist. he heard the auctioneer describe her fine points and estimate her value. He became conscious, not simply of a black form, but of life divinely given. His soul responded to the challenge of a supreme purpose and he said, "If I have a chance to strike this institution I will strike it hard." Through the years there came to him the power to blaze out the path and light up the way for a new baptism of human freedom, finally to seal that purpose with a martyr's blood and ascend to the throne of God with four million broken fetters in his hands. Now the whole world joins in a myriad-voiced chorus of love and honor to his memory. In every land and under every clime he is exalted and glorified as a mighty champion of human rights. History preserves in the clear amber of immortality the record of men, who, set on fire by some sublime purpose, dedicate the power of their lives to its prosecution. The lesson is definite and practical. The twenty-four-inch gauge and the common gavel speak to every Mason the language of constructive purpose land personal power. They mean that a Mason should cherish his ideals, the beauty that forms in the mind, the music that stirs in his heart, the glory that drapes his purest purpose, for out of these things he has the power to build for himself la new world in which to live.